Fireworks are native to the American image of the Fourth of July. The beauty and energy of the spectacle mirrors the American spirit, the thrill and risk of starting something new. But risk is central to any conversation about fireworks. According to the most current data from the Consumer Product Safety Commission, fireworks sent an estimated 8700 people to the emergency room in 2012 (it takes a few years for annual statistics to resolve, otherwise that date would be more recent). 5000 people were hurt during the 30 days surrounding the fourth of July. That's 60% of all firework-related injury happening during one-twelth of the year. While a majority enjoy fireworks responsibly a substantial number aren't following safety precautions surrounding these festive explosives. More and more people are turning to homemade fireworks to save a few dollars. This decision could be a deadly one-- 66% of firework related deaths in 2012 were from homemade fireworks. According to the CPSC, over the past 10 years, illegal explosives or homemade fireworks have typically caused 33% of the injuries associated with fireworks. The laws against these dangerous devices are enforced by the U.S. Bureau of Alcohol, Tobacco & Firearms (ATF), possessing these types of explosives can result in being federally prosecuted with substantial monetary penalties and jail time attached to a conviction. The illegal explosives are easy to recognize because they have a primitive appearance and have no labeling or warnings on them-- so beware if you've purchased fireworks packaged in plain brown paper. But simple fireworks such as bottle rockets and sparklers are underestimated in destructive capacity and more prevalent than homemade fireworks. Bottle rockets can reach speeds up to 200 miles per hour; are a significant fire hazard; and are susceptible to ricochet which means they can end up traveling in any direction. If they land on combustible materials or dry brush a fire can start very quickly. When a bottle rocket detonates, the casing can burn for a few seconds or a few minutes. A few seconds are all that is needed to start a fire. 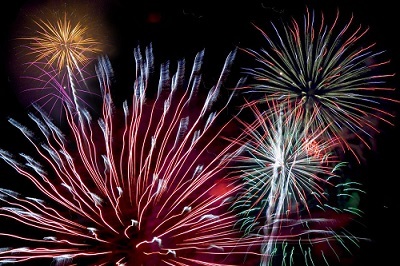 Sparklers booked at least 600 emergency room visits in 2012. Perhaps this is because sparklers don't seem as dangerous. Sparklers do not blow up and they do not have trajectory but they do get very hot. A typical sparkler can burn at temperatures up to 1,800 degrees. Such temperatures can quickly start fires and at close range can burn skin and eyes. Cherry Bombs, composed of M80s and M100s, are illegal in many states for good reason. Sixteen M80s or eight M100s detonated together can be equivalent to a stick of commercial grade dynamite. The same general principles that apply to commercial and military explosives apply to fireworks. The explosive power of these fireworks can be doubled when they are compressed or contained. Young children are among the most frequently injured by fireworks, especially by fireworks that parents and guardians believe are harmless. It is important to remember that all fireworks can be dangerous to some extent, and adults should never leave children unsupervised with access to fireworks. As the Fourth of July approaches, do not let yourself or a loved one become just another one of these statistics.